Company A on Tinian, August 5 1944. These are the survivors of the 240 men who began the Marianas campaign six weeks previously. Photo courtesy of George Smith. “Rugged” Able Company, or “Buck Schechter’s Raggedy-Assed Marines” were formed as part of the First Separate Battalion (Reinforced) in 1942. Of their original complement, only seven survived the war unwounded. 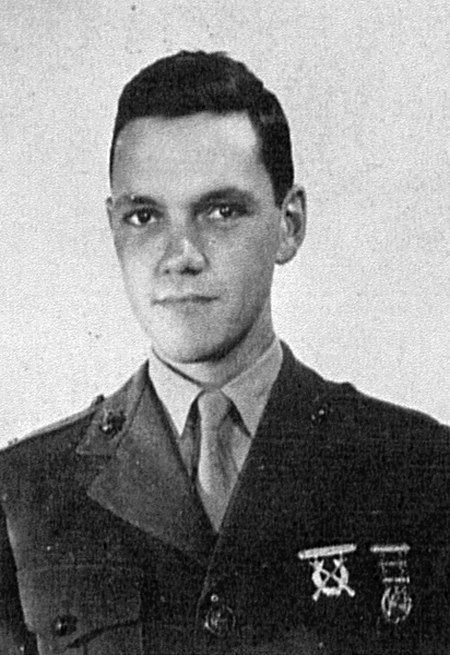 View individual biographies of the members of Company A.
October 1, 1944 Roy I. Wood, Jr. Killed In Action Roy I. Wood, Jr.
(excluding 9-18 March) William A. Eddy, Jr.
Decorations shown were awarded for service with Able Company. 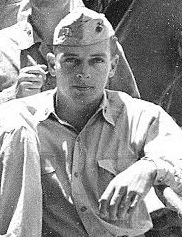 My Father, Joe Peterpaul, served in Able Co. during WWII. He passed away in 1981. I found a few photos of him on this website – thank you. Anyone have any stories or other photos? Hi Joe! Thank you for writing. I know at least one veteran who served directly with your father, I’ll ask him if he has any stories. I know someone out there has a photo album of Marines from D/24, where your father got his start. Unfortunately, I don’t have copies of those pictures; all I have are online. Would you email me at webmaster@ablecompany24.com? I’m more than happy to help search for more stories and information. I just found my father, Keith William Thomas, here on your website! I can’t tell you how thrilled I am! It seems he was in the Able Company of the 1/24. From his military records, I read that he was a combat infantryman/machine gun squad and that he also had mortar training. He was shot through the left hand by a sniper’s bullet on July 8, 1944 and after initial first aid was sent to AIEA Heights TH, on Oahu, and later to the San Diego Naval Hospital. Is it possible that you would have any further information about him and his time with the 1/24th? Is there anyone who served with him that would remember him? I will search the photos you have posted here to see if I can spot him, but if you know of any others, I would really love to see them. Thank you so much for putting this together. I just found my grandfather Ernest W. Rollings listed. I have several photos of him and other men on the list I would love to get to you. Hi Artie! Would love to see your photos. Send them on over to webmaster@ablecompany24.com and I’ll make sure they get up on the site. 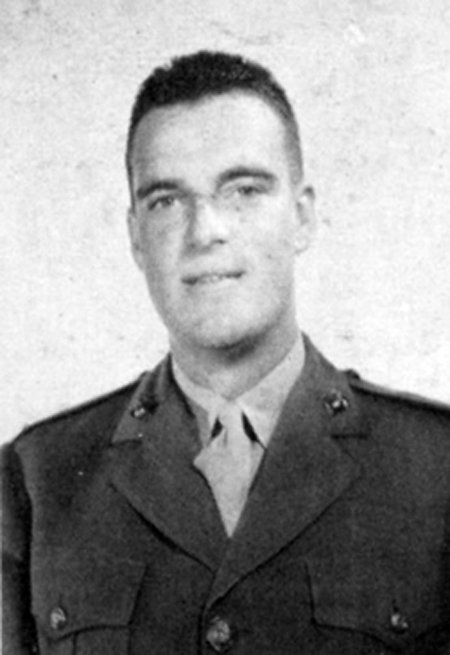 I knew my Grandfather, (George W Lindstrom) fought in WWII, in the 4th Marine division. Finding Him on the Able roster has really let me learn and appreciate a little more of Him and what He went through during the war. He passed away in 2004 and never really talked about his time in WWII. Putting all this information together is really important to preserve the rich history and sacrifice all these young men gave us. I’m going to see if I can find his marine graduation photo, I know my Grandmother has kept a lot of stuff pertaining to his time in the Marines. Thank you to the people who have put this together, It means the world to me. Thanks for writing, Lauren! I haven’t yet come across a picture of your grandfather, so if you can find one, please send it along to webmaster@ablecompany24.com. 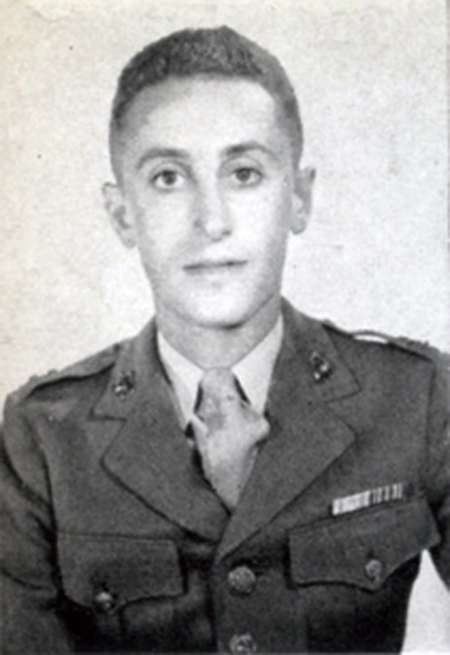 If you like, I can prepare a brief summary of his time in the Marines for you – and if you have any biographical stories your family would care to share about him, I’ll add them to his individual page. I wanted to thank you for creating this page. My grandfather, Lionel “Pappy” Salazar, served in the Able Company. (I know this now because of your page, thanks.) I was curious if you could find out or if you know of any other veterans that he served with him. And any other information/stories would be great! He passed away last year and I never asked him about his time in the war. He was a passionate marine and wore a red shirt almost everyday with his USMC belt. I believe he was president of the Eastex Marine Corps in Conroe, Texas for several years. Thanks again! Hi Sara – actually, I do know one or two veterans who served with “Pappy.” I’ll send you an email with more information tonight. My father, Robert Tierney served in Company A, 1st Battalion, 24th Regiment with your grandfather. When the 4th Marine Division held a reunion in San Antonio I was able to meet your grandfather. My dad passed away in December of 2012. My dad had a camera on Maui and I can see if your grandfather is in any of the photos he took or if my dad mentioned him in any of the writings/oral histories he prepared. Thank you so much for creating this page. My Papa is in the picture above, Gunnary Sgt. Thomas Drake (far right kneeling). If you have any stories or information, I would love to pass them along to my Dad. Hi Maren – sorry for the delay in getting back to you, I do have some information on Gunnery Sgt. Drake. Will send you an email soon. 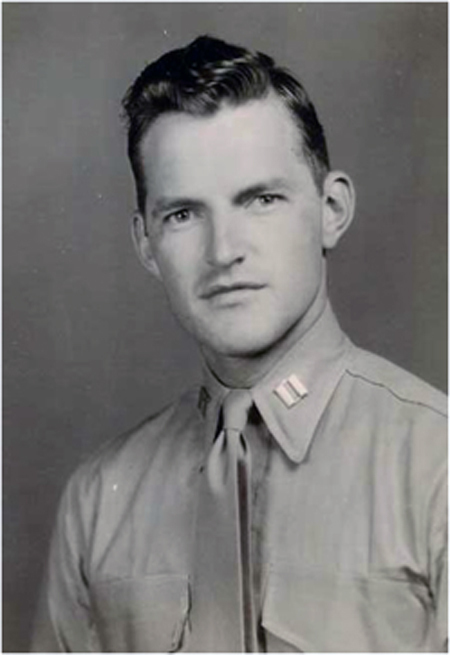 I’m doing some research of my family tree and I learned that my uncle Pfc Leroy John Heath.Killed in Action at Tinian. I don’t have any picture’s of him. I don’t know if there are any pictures or information about him or where I could find other military information other than here. Any help would be greatly appreciated. Hi Georgianna – I have a little information that might be helpful to you. Will follow up by email today. ;My cousin, Conway Middleton was from Calvert Texas. 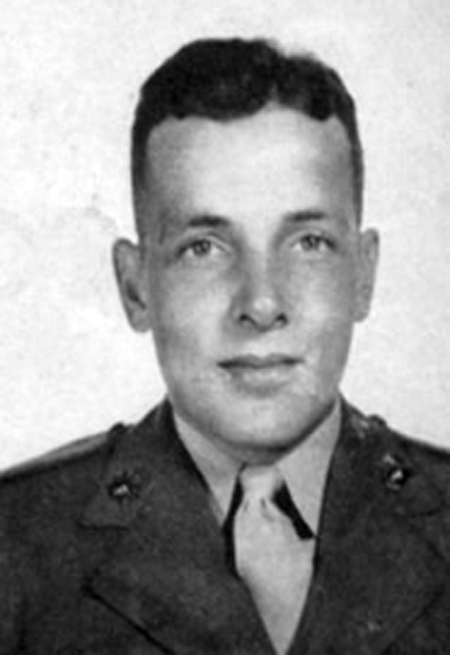 Conway was killed in action on Iwo Jima , Feb. 20th 1945. The only information I have is he was a BAR rifle specialist. I am interested if anyone remembered Conway and has any information or stories. I am so happy I came across this website. My grandfather, Srgt. Charles B. Rogers, Jr. always talked about his experiences of the war to my sisters and I (but I was not aware that he was part of the Able company). He always smiled when he talked about his platoon members and all the things they went through. He passed away in November of 2014. I saw his picture on a google search which brought me here and I am so glad it did. Thank you for putting all this information together for loved ones of these men can find it. The Tinan photo you have on able company has my Great Uncle Cecil F. Hendershot in the last Row topside far right side showing bandage from wounds received and i sent another picture was wondering if you got it? 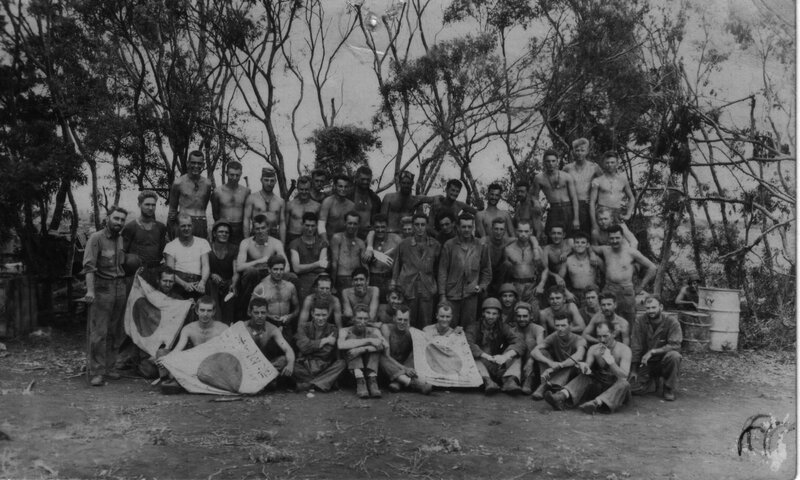 Ed Lykins (2nd row 2nd man over from left, with bandage on his shoulder). He showed me this very same photo back in the 80’s when visiting in FL. He was a mortar man. Never talked about it too much but he mentioned all of the campaigns and some memories, some comical, some sad. I knew him through my Mom who was with him since the early 70’s. He sadly passed in the mid 80’s. I forget the exact year. He was a good fellow. I was interested in any information on Howard Lawrence Webber. He was in 1st battalion, 24th marines Able company, Iwo Jima. He is my dad, he died when I was very young and I never got a chance to know him. I also have a picture which could be included on his page. Hi Mr. Webber, it’s nice to hear from you. I’ll send you an email with some info about your father.